Introduction: Dodge was the last one to the pony car party, but it spent its time wisely, perfecting its entry, the Challenger. The Challenger debuted with an engine lineup that ranged from a docile slant six to the powerful 440 Six Barrel and the awesome 426 Hemi. Other pony cars could only dream of a line up like that. 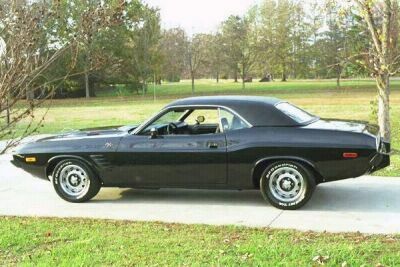 Comments: The Dodge Challenger was based on the Plymouth Barracuda platform, but its wheelbase was stretched by two inches to provide more interior room. The Challenger was offered in both hardtop and convertible versions. Performance versions wore the R/T (Road/Track) badge and either the base or R/T model could be ordered with the SE luxury package. The SE package included leather seats and a vinyl roof with a smaller “formal” rear window. 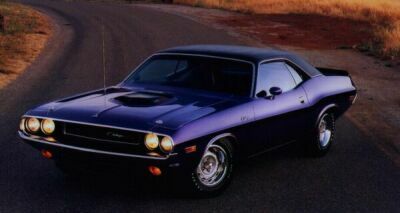 Challenger R/T’s came standard with the 335 bhp 383 engine. Optional were two 440 engines, the four-barrel Magnum with 375 bhp and the tri-carb Six Pack with 390 bhp (chosen by 2,035 buyers). Topping the list was the almighty 426 Hemi with 425 bhp (chosen by 356 buyers). The Hemi cost an additional $1,228 and required heavy-duty equipment. The 440s and the Hemi came standard with TorqueFlite automatic. Optional was a four speed manual which included a pistol-grip Hurst shifter and a Dana 60 axle. Gear axles climed from 3.23:1 to 4.10:1, with limited slip as an option. All R/Ts received a heavy duty suspension and the 440s and Hemi received 15 inch 60 series tires, although essentials such as power steering and front disc brakes were still optional. The R/T’s standard hood had two hood scoops, but they did not feed directly into the air cleaner. For just $97, the buyer could specify the shaker scoop, which mounted to the air cleaner and stuck up through an opening in the hood. It was known as the “shaker” as it vibrated along with the engine. Some faults of the Challenger included poor outward visibility and it feeling too bulky for its size. But Dodge had one more trick up its sleeze. In order to race in the Sports Car Club of America’s Trans American Sedan Championship, it built a street version of its race car (just like Plymouth with its Plymouth ‘Cuda AAR) which it called the Dodge Challenger T/A (Trans Am). Although the race cars ran a destroked version of the 340, street versions took the 340 and added a trio of two-barrel carbs atop an Edelbrock aluminum intake manifold, creating the 340 Six Pack. Dodge rated at the 340 Six Pack at the same 290 bhp rating as the original 340 engine (and mysteriously the same rating as the Camaro Z/28 and Ford Boss 302 Mustang), it actually made about 350 bhp. It breathed air through a suitcase sized air scoop molded into the pinned down, lift off matte-black fiberglass hood. Low-restriction dual exhausts ran to the stock muffler location under the trunk, then reversed direction to exit in chrome tipped “megaphone” outlets in front of the rear wheels. TorqueFlite automatic or Hurst-shifted four-speed transmission, 3.55:1 or 3.90:1 gears, manual or power steering were available. Front disc brakes were standard. The special Rallye suspension used heavy duty parts and increased the camber of the rear springs. The T/A was among the first production vehicles to use different size tires front and rear: E60x15 fronts, and G60x15 in back. The modified camber elevated the tail enough to clear the rear rubber and its side exhaust outlets, thick side stripes, bold ID graphics, and a ducktail spoiler added to the street punk image. The interior was strictly stock Challenger. Unfortunately, the race Challenger T/A wasn’t very competitive and the street version suffered from severe understeer in fast corners. But it could turn mid 14s in the quarter mile which would do any small block muscle car proud. The T/A would only be available for 1970 as Dodge would pull out of Trans Am racing. 340 V8 275 bhp @ 5000 rpm, 340 lb-ft @ 3200 rpm. T/A: 340+6 V8 290 bhp @ 5000 rpm, 345 lb-ft @ 3400 rpm. 426 Hemi V8 425 bhp @ 5000 rpm, 490 lb-ft @ 4000 rpm. 440 V8 375 bhp @ 4600 rpm, 480 lb-ft @ 3200 rpm. 440+6 V8 390 bhp @ 4600 rpm, 480 lb-ft @ 2300 rpm. T/A: 0-60 in 5.9 seconds, 1/4 mile in 14.5 seconds @ 99.6 mph. R/T 440-6: 0-60 in 6.2 seconds, 1/4 mile in 13.7 seconds @ 105 mph. 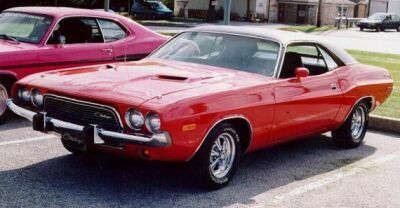 Comments: For 1971, the Dodge Challenger received a new grille and several other changes from 1970. The Challenger T/A was advertised but never made and was officially dropped (as Dodge had withdrawn from Trans Am racing). The R/T convertible was also dropped and the SE package was only available on base model Challengers. The R/T for 1971 had color-keyed bumpers, dummy brake cooling slots on its rear flanks, and new tape stripes. The 383 engine was still standard on R/T models, but it was detuned to 300 bhp due to a lower compression ratio to meet new government regulations. The base 440 was dropped, but the 440-6, rated at 385 bhp (down 5 bhp from 1970) and the Hemi, still rated at 425 bhp were still available. But that didn’t stop a severe sales slide as sales fell 60% in just the Challenger’s second year. A small group of Dodge dealers tried to boost Challenger sales in 1971 by providing 50 specially prepared examples as official and pace cars for the Indianapolis 500 race. All of these cars were Hemi Orange convertibles with white interior, although just two had high-performance options. One — the pace car — skidded and crashed into a press box, injuring a number of reporters. Not surprisingly, the pace car decal sets available through Dodge dealers did not sell well. 440+6 V8 385 bhp @ 4600 rpm, 480 lb-ft @ 2300 rpm. Comments: The 1972 Challenger gained new front end styling which included a new eggcrate grille which had downturned ends. Critics noted that it was showing a sad face to its own emasculation. 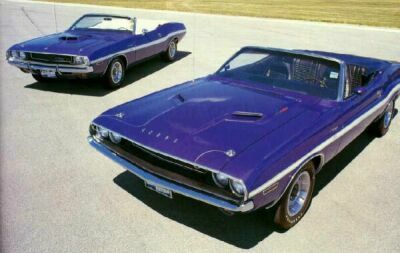 The R/T performance version was dropped and convertibles were eliminated. The 440 and Hemi were also dropped. A new Rallye edition replaced the R/T model, but sported only a 318 with just 150 bhp (net). The largest engine available was a 340 with just 240 bhp (net), a far cry from just the year before. 340/240: 0-60 in 8.5 seconds, 1/4 mile in 16 seconds. Production: Engines: 318 V8 150 bhp. 340 V8 240 bhp. Comments: The Dodge Challenger continued its downward slide for 1973. The Rallye edition was dropped, although buyers could still build their own on the option sheet. Sales were still up for the year, even though most of these cars had the 318 with 150 bhp, hardly a performance machine. Still available was the 340 with 240 bhp but it was replaced at mid-season with a new 360 V8 debuted with 245 bhp. The increased capacity was the only way that Dodge could keep power up in the face of tightening emissions control regulations. Comments: 1974 would be the last year for the Dodge Challenger, still available with the 360 for those that wanted any real performance. The Dodge Challenger lived just five short years, but it made its mark on the muscle car era.